Generation Z May Not Want To Own Cars. Can Automakers Woo Them In Other Ways? Selling cars to the group that follows the millennials won't be easy. Instead of just making cars, automakers are trying to make a move, whether it's car-sharing, ride-hailing or self-driving. 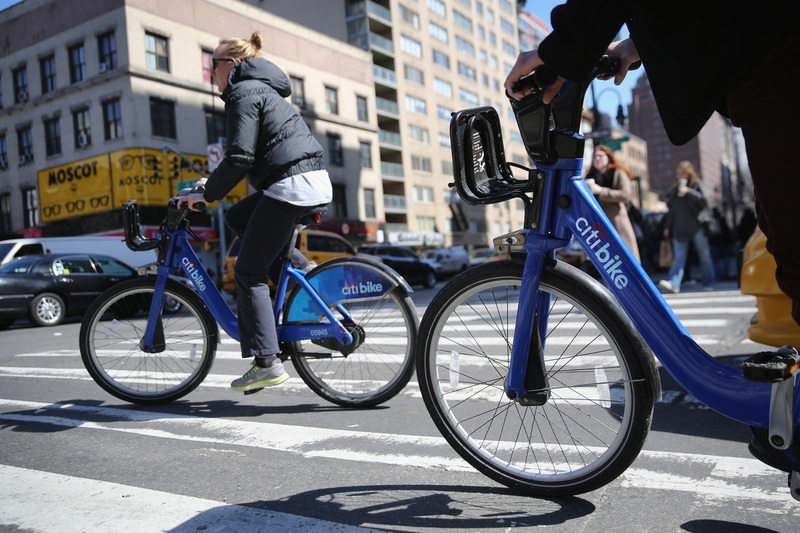 Citi Bike users pedal through the streets of Manhattan. Some members of Generation Z, the younger generation following the millennials, are less inclined to own cars and lean more toward bike-sharing and ride-sharing services. Sheryl Connelly has a crazy job. She's in charge of looking into the future for Ford Motor Co. The automaker is trying to predict how people my age — from Generation Z — will use cars. "I have two Gen Zers at home," Connelly says. "So my 16-year-old daughter is thrilled, actually. Her car is ready to go. As soon as she has her license, it's in the driveway. And so she sits in her car and she listens to the radio and she loves her car." I'm 18 and I don't want a car. I am from the San Francisco Bay Area. I take buses and trains. I bike, and when I need a car, I use Lyft. Connelly says Gen Z is a game changer. "They don't really care about ownership," she says. "They don't necessarily see that their vehicle is going to be a status symbol. In fact, they're really savvy customers and can be quite frugal." But Connelly says that doesn't scare Ford. "We're ready for you. If you want to buy a car, we've got it for you. If you don't want to buy a car, we can still help you there," she says. 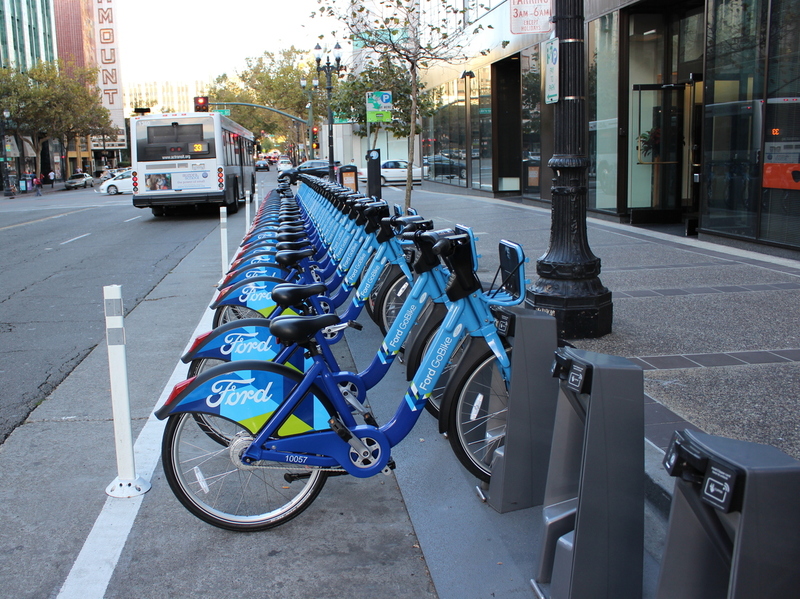 Ford GoBike launched its bike-sharing service in the Bay Area this year. Ford started its own bike-sharing service recently. It wants to sell to people like me who have no interest in buying a car. The Big Three U.S. automakers — Ford, Fiat Chrysler and General Motors — say they are no longer just automakers. Every major car company is trying to make a move, whether it's car-sharing, ride-hailing or self-driving. GM has a new car-sharing app called Maven that it's betting billions on. "We needed to create a new brand because this is really about access and not necessarily ownership," says Peter Kosak, executive director of urban mobility for Maven. Kosak says GM's new car-sharing company was created to target millennials and Gen Z. While my friends and I aren't really interested in car ownership, we are redefining what it means to travel by car. Susan Shaheen, a transportation researcher at the University of California, Berkeley, has been studying ride-sharing since the '90s before it was a real thing. She says this isn't all bad news for car companies. "If you are using their mobility services, chances are they're going to have a lot of data about your preferences," Shaheen says. "They're going to know a lot about where you travel and how you travel. They're going to be in a very good position to market to you." Even if you haven't thought about owning a car, you are essentially being placed on the road to ownership. Engaging in these car services is essentially test driving, which is the first step in purchasing a car. "This is a business opportunity for us," says Maven's Kosak. "You're in that perfect case, and maybe later you will want to own a car." So the car industry is hoping that I may want a car in the future, even if it's not a priority now. If this sounds familiar, think back on all the doom and gloom about millennials not wanting to own cars. Millennials are starting to buy cars in big numbers, The Associated Press reported last year. They just had a late start — mostly because of the Great Recession. Could the same thing happen for Gen Z? "We think that maybe, as Gen Z ages ... if you decide about getting married and having children, you may have one personal vehicle in the household," says Michelle Krebs, an analyst for Autotrader. She may be right, but that's not happening for me yet. I've always wanted to live in Los Angeles, and I recently got to move down for college. Before I moved, when I told people that I wouldn't have a car, they'd say, "Oh, good luck." I didn't need luck because there's Lyft and Uber — even taxis and a train that will take me from my dorm to the ocean. And right now, for people who are selling cars, I'm a problem. And so is the rest of my generation. That is what is sending car companies into their own identity crisis. This story is part of a series, We Are Generation Z. It was produced by Youth Radio in collaboration with NPR's Sonari Glinton.